Using Digital Watauga is FREE and relatively easy once you know how the navigation quirks of Omeka—the name of this digital platform—work. First, though, please note that it is not necessary to register or login to use Digital Watauga, and we do not approve registration requests. All users can comment on any item in a collection by using the comment field at the bottom of the page for that item. Comments are moderated and may not appear instantly. 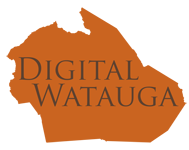 If you want to contact Digital Watauga staff for any reason, including donating a collection or image to Digital Watauga, please email us at DigitalWatauga@gmail.com. There are two primary ways of exploring the content on Digital Watauga: browsing and searching. * Click on “Browse Collections” in the left menu list. * The resulting page will show the total number of collections available to the public, listed in reverse order of when they were added (most recently added are at the top), ten collections to a page. Scroll through the collections to find the one you are interested in exploring, then click on the name for that collection, which is hyperlinked. * The resulting collection page is the landing page for that collection. Each landing page usually shows the name of the collection, a brief description of the collection, and some basic metadata about the collection. In some cases, a finding aid (as a PDF) will be linked to the collection description. * This landing page also shows a maximum of ten sample items from the collection, but in most cases there are many more items to explore. To access all items in the collection, scroll down past the description of the collection and the first ten items to the TINY link that begins with the hyperlinked words “View all ## items,” which should be located immediately below the last sample item on that page, then click on the link. * The resulting page will have the words “Browse Items (## Total)” at the top. From this point, you can either browse through the items directly or use the tabs at the top of the page “browse by tag” (tags are search terms entered into a database by Digital Watauga) or “search items” (this search feature is less sensitive and will pull all items featuring the word(s) you search for). See the information below for tips on searching. If you choose to browse through the items directly, please note that they are listed ten to a page in reverse order of when they were added (most recently added are at the top). * There is also an option on the left menu list called “Browse Items.” This is generally useful only if you want to see items added since the last time you visited, since items appear in this list in reverse order of when they were added (last ones added show up first). * Click on “Browse Items” in the left menu list. * The resulting page will have the words “Browse Items (##Total)” at the top. From here, click on the “Search Items” tab near the top of the page. * The best way to find items is often to search via keyword. So, let’s say that you are interested in things related to West King Street in Boone. Including the word “Boone” in your keyword search will generate nearly 1,000 results, so that’s probably not an efficient way of finding what you’re looking for. On the other hand, searching for “West King Street” will ignore more than 40 items that show up by searching strictly by “King Street.” Be creative. Sometimes you’ll find things you’d otherwise miss by varying your search terms. * Another way to search is via the identifier associated with a particular item. This is especially useful if you’ve seen an image elsewhere online that includes the identifier number. For example, let’s say you want to see the photo of Palmer Blair’s photo shop that you saw credited on Facebook as “Pal-Bla-1-2.” This identifier represents the collection name code (“Pal-Bla” for Palmer Blair Collection), followed the series or box number (1), followed by the item number within that series or box. You can enter this identifier as a keyword to find the image, and it will show up…along with 12 pages of other items from that collection. This is because of a numbering glitch that we are currently working on fixing, wherein the search term “Pal-Bla-1-2” captures not only the correct image but also every other image identifier that starts with that, such as “Pal-Bla-1-24” and “Pal-Bla-1-245.” A quick workaround is that lower numbers appear deeper in search results (remember: last one in shows up first), so you can skip to the end of the results—in this case, page 12—and that low-numbered result will be right there. * This identifier number is also useful if you want to find all of the items from a particular series or box. So, let’s say you see some publicity about Palmer Blair Box 6 being recently made public. You can search by “Pal-Bla-6” and bring up all of the items in that box. * There are other ways to limit your search results using the dropdown menus below the keywords box. For example, you might have heard that the Palmer Blair Collection contains some great images of the original Tweetsie (ET&NWC Railroad) engine during its homecoming in 1956. You can search for “Tweetsie” as a keyword and limit your search to the Palmer Blair Collection in the “Search by Collection” dropdown box below the keyword box.